Native Instruments' FM8 is one of the most popular FM synths. Contemporary virtual FM instruments such as Native Instruments' FM8 and Image-Line's Toxic Biohazard mean it's never been easier to unlock the power of FM synthesis, and the creative potential of the technique is at last truly starting to be realised by producers looking for new and exciting sounds. 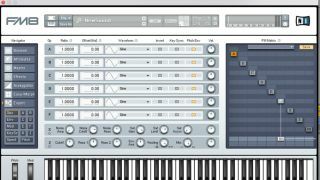 Nevertheless, FM remains misunderstood: while today's virtual instruments and their luxurious graphical displays are a world away from the now-prehistoric DX7, they can still be tricky for novice users to 'break into' - often because of their open-ended nature and full-on, matrix-based interfaces. But we're here to show you just how easy and fun FM synthesis can actually be, using the aforementioned FM7 and (optionally) VPS CM Scope, which comes free with this month's edition of Computer Music magazine. For more on FM synthesis, pick up Computer Music 216, which is on sale now. Step 1: Let's start with the absolute basics. Load Native Instruments' FM8 (a demo of which is available) onto a MIDI track on your DAW, and put the visual analysis tool VPS CM Scope, given away with Computer Music 216, on the master track. Click the Spectrum button at the top of CM Scope's interface to put it into spectral analyser mode. Step 2: In FM synths, oscillators are usually called operators, and in its default state, FM8 has just a single one active. This is set to a sine shape, so when you play the instrument, you'll see a single frequency appear on Scope's display. Let's introduce some FM. Click the Expert button on the left-hand side of FM8's interface. At the right-hand side of the Expert screen is the synth's FM Matrix. Step 3: Operator F is the audible one. Let's activate Operator E by right-clicking it, then click it to bring up its parameters. In the FM Matrix, drag the slot under Operator E and to the left of Operator F up to 100, and play a note. We've just created a routing from Operator E to Operator F, and you'll see that it's generating a lot of harmonics. But what's actually happening here? Step 4: Although we can't hear Operator E directly, its output is modulating the frequency of Operator F: essentially this manifests as really fast vibrato. If we turn down Operator E's Ratio to 0.0025, it will oscillate very slowly, so we hear (and see) a vibrato effect rather than the creation of new audible harmonics. Step 5: If we turn down the Operator E to Operator F modulation amount, the vibrato effect is diminished, eventually stopping altogether. Now set it back to 100, and drag up on Operator E's Ratio as you play a note. In Scope CM, you'll see new frequencies - known as partials - appear both above and below the original frequency. These new frequencies are termed 'sidebands'. Step 6: So, adjusting the frequency of the modulating operator's Ratio changes the timbre of the output. Now set Operator E's Ratio to 2.0000 (ie, an octave above the played note), and try adjusting the Operator E to F modulation amount again. Reducing it makes the harmonics quieter - a bit like a low-pass filter. We can use Operator E's envelope to adjust the timbre of the sound over time. Step 7: Return the mod amount to 100 and drag the square at the top right of the envelope down. This makes the modulating operator, E, start loudly then decrease in volume, giving an effect much like a filter envelope closing. Using ratios to create a particular timbre, and operator volume envelopes or LFOs to control the "strength" of the timbre over time are the two basic tenets of FM synthesis. Step 8: It's possible to create even more timbres by introducing operator self modulation. In FM8, drag up in the slot above Operator E in the FM Matrix. High values can create very harmonically rich, noise-like effects. Set Operator E's self-modulation to 50 to add some crunch to the start of the sound, then self-modulate Operator F with a level of 30 to get a really rich, bouncy bass.